Our body is made up of about 68-75% water and 15-25% protein. Because almost a quarter of our body is formed from protein, obviously protein plays a very important role for our well-being. Builds blood which transfer oxygen to our cells. Controls brain and nerve signalling. Builds enzyme which help with digestion of food. Helps with duplication and combination of body cells into organs. Builds antibodies to strengthen our immune system. Works as cellular messengers to transmit messages between cells. Builds muscles and enables muscular movements including chewing of food, blinking of eyes etc. Builds and grows hair and nails. Fatigue e.g. feel very tired after lunch. Hormone imbalance e.g. feel uneasy or unhappy. Weak immune system, with tendency to fall sick easily. Healthy hair, as 91% of our hair structure is made up of protein. Safer - less harmful chemicals and safer for long-term consumption. Digestion - easier to breakdown the protein into amino acids, faster to absorb without being too taxing on our digestive system and more efficient. Higher bioavailability. There's a higher amount of protein / 100g of food. For animal source, it's 13-21 g / 100 g of food intake. For plant-based source, you get 12-36.5 g / 100 g of serving. The 36.5 g is from soya protein. Simple - less cooking and processing. Safe - no cholesterol, purine, lactose, colouring and preservative. It's safe for people with high uric acid and gout condition. Effective - higher absorption rate and doesn't burden our digestive system. Convenient - in sachet form. Every sachet is fresh and un-oxidised. 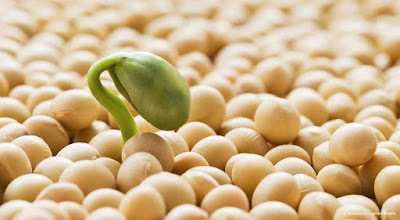 Rich in nutrients and provide energy for daily needs. Has high vitamin B group and calcium content. Protect cardiovascular health and reduce cholesterol, vessel hardening and heart diseases. The lecithin in the formulation helps to clean the cholesterol in our blood. Improve density of bone matters. Reduce draining of calcium and minimise bone fractures. Improve memory and reduce the risk of Alzheimer Disease. Healthier skin, glowing hair and tougher nails. A 54-year old lady has been suffering from sleeping disorder for over 20 years. She regularly has trouble sleeping well and would end up watching TV until 5 am. As a result, she feels very tired in the morning and finds it very difficult to go out. 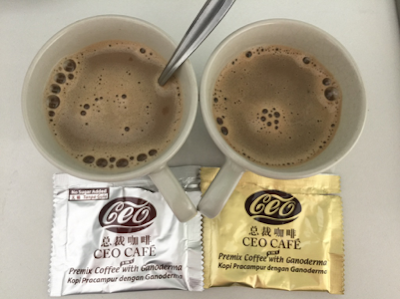 She started taking 5 capsules Yung Kien Ganoderma + 2 sachets Yung Kien Pollen + 6 sachets Jia Hor Soya Protein a day. After 2 months, she says she can sleep from midnight till 8 am. She feels more energetic and is able to go out for her activities. A 7-year old boy is hyperactive and has difficulty concentrating in class, which leads to many problems in school. He is also skinnier compared to other boys his age. His mother fed him with 4 capsules Yung Kien Ganoderma + 2 sachets Yung Kien Pollen + 2 sachets Lactoberry probiotics + 2 sachets Jia Hor Soya Protein everyday for 1.5 years. After 3 months, he has gained 1.5 kg. After 1.5 years, he has gained 4.5 kg. 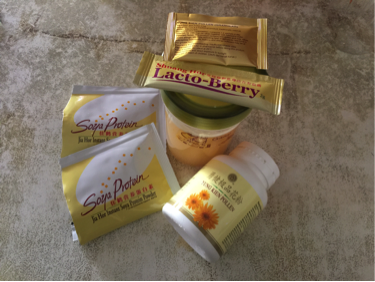 Before consuming these products, he has never gained more than 1 kg a year. One of the obvious benefits is he is more calm and is able to concentrate better in class. It gives a huge relief to his mother. A 27-year old lady has been suffering from gastric attacks for many years. The pain would sometimes be so bad that she can't move. On one occasion when she had a gastric attack, she was advised to consume 2 sachets Jia Hor Soya Protein by her colleague. Much to her surprise, within only 5 minutes, she could walk and joined her colleagues for lunch. Please email me at askfuiping@gmail.com to purchase Jia Hor Soya Protein. I am an authorised Distributor. Click here to refer to Shuang Hor company website for Product Description and Price.